English cucumbers, also called hothouse cucumbers, are best for this garnish. 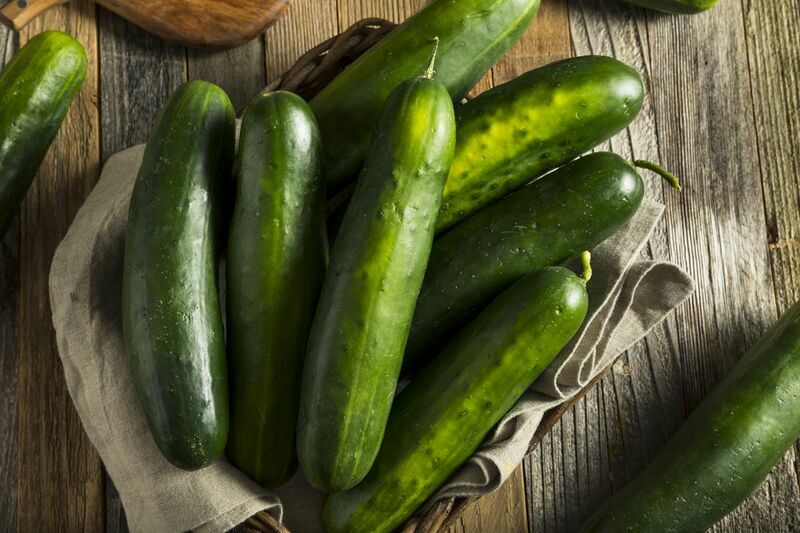 If you use standard cucumbers, look for a straight cucumber of a thin and uniform diameter. Wash and dry cucumber. • Sharp paring or boning knife. • Cut a length of whole, unpeeled cucumber about 5 inches in length.• Insert wooden skewer through the center of the cucumber. • Beginning at one end of the skewered cucumber, place your knife at a slight angle about 1/4-inch from the cut end.• Cut down to the skewer. • Continue cutting with the blade resting against the skewer while turning cucumber.• Follow the original cut, taking care to keep the slice 1/4-inch in diameter until you reach the end. • You can make these as long or short as you want, although you'll want at least three turns around the skewer to get the spiral effect.• If you have a steady hand, you can make the thickness less than 1/4-inch for a more delicate spiral, but they won't stand erect. • Leave the spirals standing erect or flatten them. Curl them by putting the ends together or leave them straight. Your choice.• You can use other vegetables in place of cucumbers such as zucchini, parboiled al dente carrots, radishes, beets, and others with a firm core.